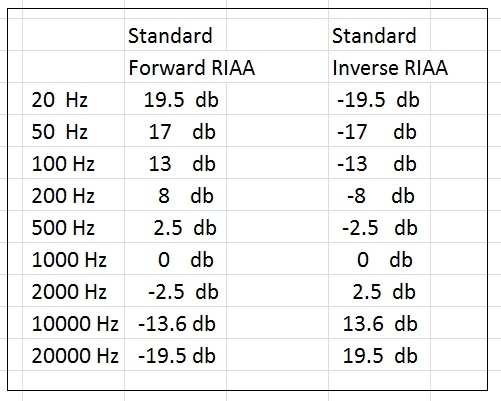 In low frequency C almost open then 9R and R deliver 0.1Vin to output. 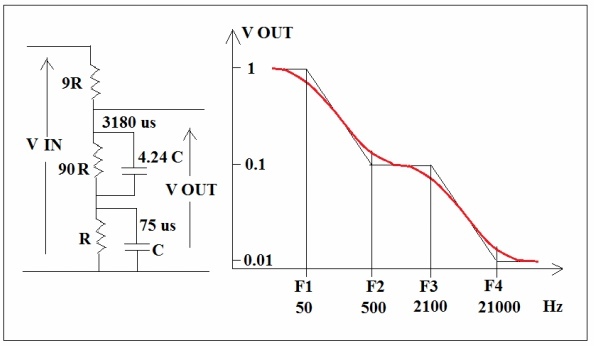 In high frequency C almost shorted circuitand deliver 1Vin to output. 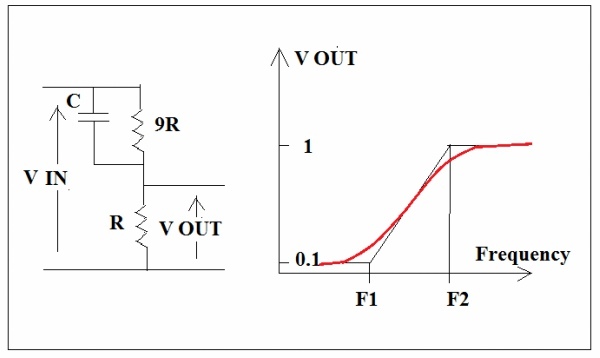 F1 and F2 are known as turning frequencies which determined by R and C time constant. Actually time constant = RC which is a time required to go through one radius angle, a completed cycle is 2π radius.In this case if 9RC=3180 μs, 3180x2x3.1416=19980 μs. 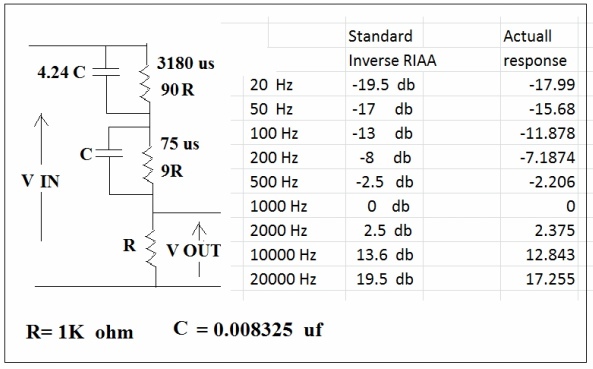 If 9R and R connected in parallel it is equal to 0.9R, then 0.9RC=318 μs that means 500Hz. 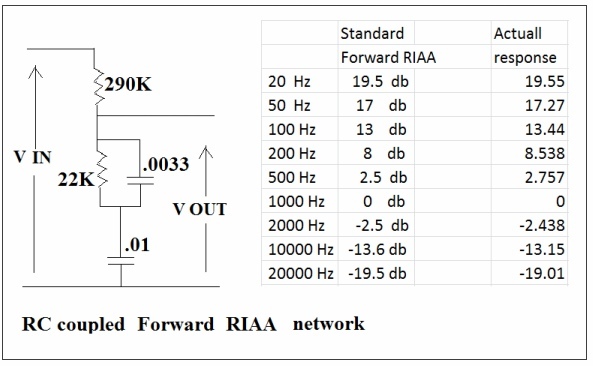 In low frequency range, the 75 μs part C as if opened and 9R+R= 10R this is similar to basic network but the output now is from 0.01 Vin to 0.1 Vin due to 9R and R ladder giving 1/10 of standard output level. In high frequency range, the 3180 μs part 4.24C as if shorted circuit , then C , 9R and R form a basic network giving 0.1 Vin to 1Vin output level. 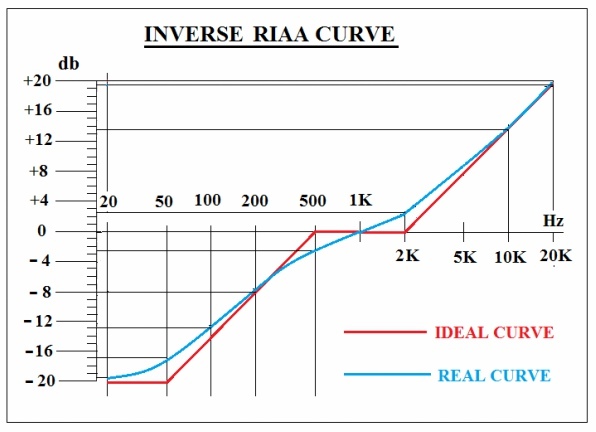 The overall response curve is match the RIAA requirement and this network and curve are known as Inverse RIAA response. 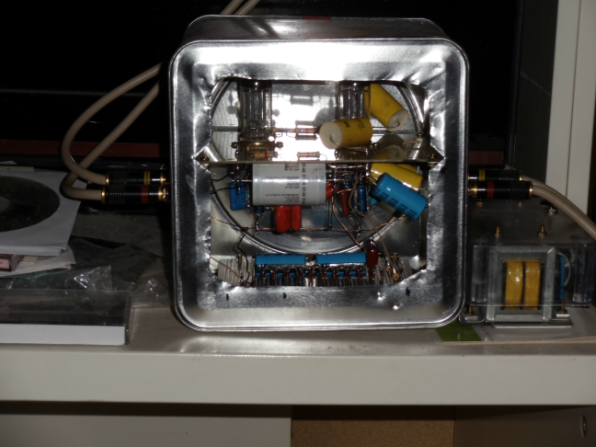 Phono amp DIYers could roughly estimate the time constant by RC value to see weather matches3180 μsand 75μsor not. From my experience 1.5 or two db drift from standard curve will affect the sound reproduction and human ear can identify the difference. There are two db difference in both low side and high side, by experience I suppose the base is a bit weak and high will be too bright. So that the RC value has to be fine tuned to fit the standard. 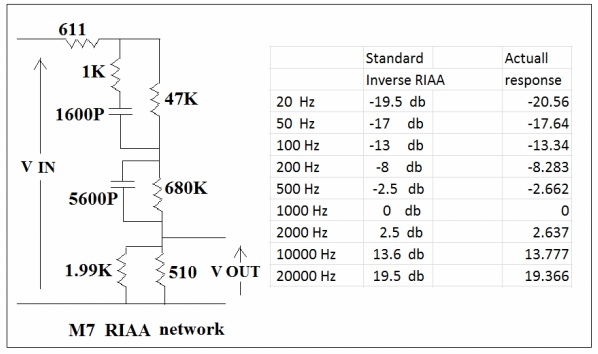 There are lots of information in the inter net telling about how to design a RIAA network,I suppose those design calculations are approximations trying to match the RIAA standard as much as possible. But very rare of information telling about how to confirm the network response stick to standard curve. May be some computer program packages from the market can help, users can input the RC values of the network and then the program will calculate and give the result both in graphic and figures. The only thing we can do is to trust it. Of cause we can measure and fine tune the curve by signal generator and oscilloscope but we have to build the machine first. Actually we don’t have to because we can develop a mathematical formula for the network to find out the detail response in specific key frequencies. The detail mathematical formula derive is boring, anybody interested please refer to my “RIAA network analysis” article. 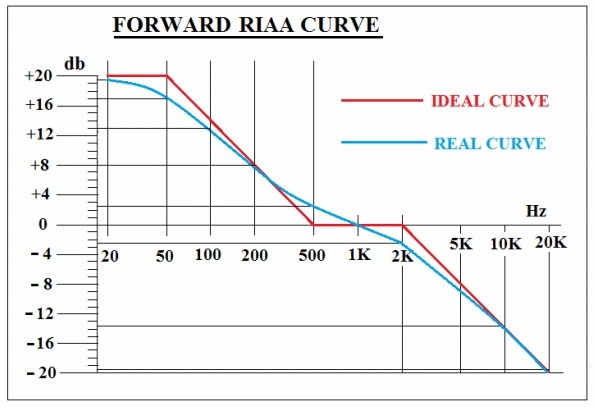 There are two major type of RIAA phono amps, negative feedback type and forward RC coupled type, the negative feedback type uses inverse RIAA network while the RC coupled type uses forward RIAA network. 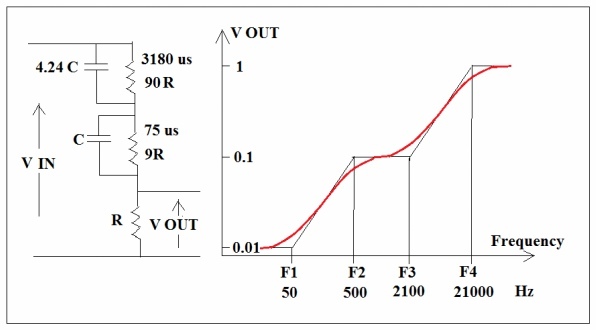 Where 611 ohm is output impedance of the cathode follower, 1.99K is input impedance of the feedback point.47000x.0016= 75.2 μs quite matches, 680000x.0056= 3808 μs which is about 20% more than 3180 μs. But the overall response is very close to that of standard. 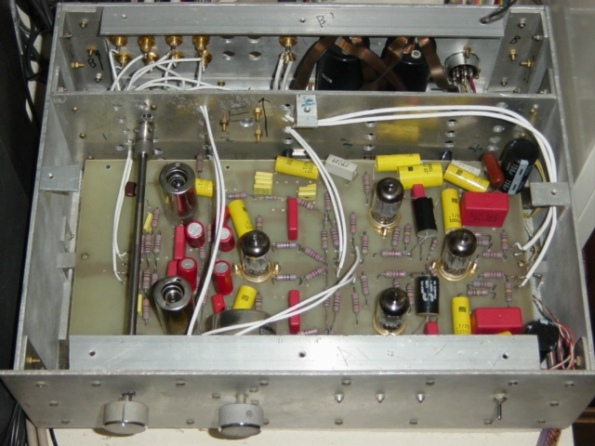 The response is ok but the feedback loop involves two voltage amp stage and one cathode follower stage so that it is a bit long, and then the high frequency detail resolution is affected but it will give a worm sound , still a very good design in that ages. 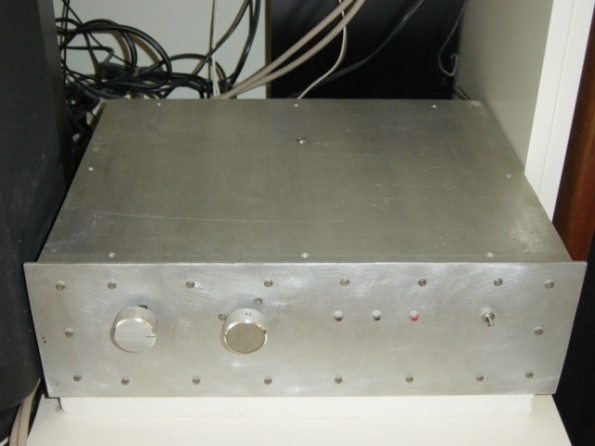 It sounds excellent with brisk high and tight bases, simple is the best, a very good design. 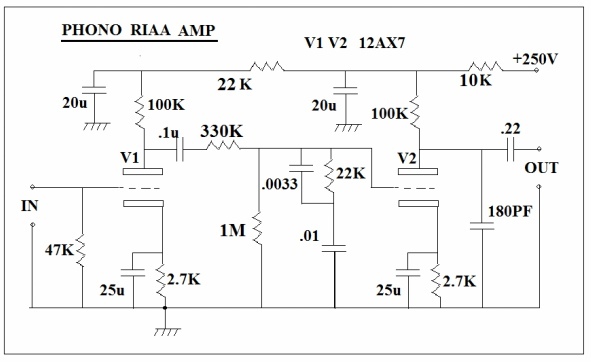 I suppose most RIAA amps are based on above mentioned networks and the results are more or less the same. Somebody suggested LC networks for this purpose and claimed high end results, the problem is very difficult to get high quality chokes with few henry inductance and of cause the very high price.